City Council met in an April 1, 6:00 p.m. executive session and discussed an appointment to the Board of Zoning Appeals. Council also received a legal briefing on (1) a proposed Common Interest and Confidentiality Agreement between the City of Myrtle Beach and the City of North Myrtle Beach, (2) a proposed Confidentiality Agreement between municipalities and Horry County regarding I-73, (3) the Maritime parking lot, and (4) property acquisitions. Council took no action. City Council met in an April 1, 7:00 p.m. meeting and as its first item of business recognized the Coastal Chairmen Wheelchair Basketball Team for its accomplishments. The team calls the North Myrtle Beach Aquatic & Fitness Center home, holding weekly practices and league games there. 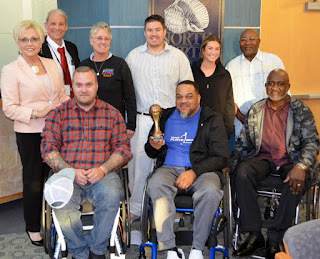 The Coastal Chairmen went 14-8 in games during the 2018-2019 wheelchair basketball season, and placed second in the 2019 Carolina Wheelchair Basketball Championships. City Council postponed second (final) reading of a proposed ordinance to prohibit single-use carryout plastic bags at retail establishments in the city until its April 15 meeting. Between now and then, Council and staff will consider suggestions for refinements to the proposed ordinance received during an April 1 workshop. City Council passed first reading of a proposed Zoning Ordinance text amendment to create an overlay district defining architectural, signage, landscaping, pedestrian amenities, lighting and parking standards for center of activities. The 2018 North Myrtle Beach Comprehensive Plan identifies important corridors in the city that would benefit from establishing design standards to encourage quality development. The five focus areas are Main Street, 17th Avenue South, 37th Avenue South, Sea Mountain Highway and Little River Neck Road. The proposed amendment rests on the concept that growth and development occurring in these areas over time should follow the community’s vision and take the form of walkable, mixed-use centers to serve local neighborhoods and hospitality needs. City Council passed first reading of a proposed ordinance to rezone 6.4 acres of land at 601 Main Street from Planned Development District (PDD) to Highway Commercial. The property is vacant and undeveloped and was previously zoned Highway Commercial prior to creation of the Town Center on Main PDD in 2016. The purpose of the Highway Commercial zoning district is to provide commercial opportunities to the traveling public and areas where large-scale commercial projects may occur with minimal impact on contiguous residential development. City staff proposes a text amendment that allows driveway access to a corner lot from the more heavily traveled street when the frontage along that street is less than 150 feet at the discretion of the City Engineer. When making an exception to this standard, the City Engineer could require any design modifications to the site plan deemed necessary to maximize safe and efficient access. If the corner lot fronts a S.C. Department of Transportation (SCDOT)-owned road, SCDOT approval of the access would also be required. However, City requirements may be more restrictive than SCDOT requirements. City Council passed first reading of a proposed ordinance that would result in a Non-Warranty Deed rescinding the Road & Drainage Dedication Deed dated October 17, 2018 and recorded March 6, 2019, at Deed Book 4189, Page 1558, Horry County Register of Deeds. To avoid exposing the City to future maintenance, ownership and liability, a deed dedicating these streets and drainage systems to the City is to be rescinded. The Blackwater at the Dye Club townhome development utilizes privately owned and maintained streets and drainage systems within its subdivision. As part of the project closeout process, the subdivision’s project engineers inadvertently recorded a deed dedicating these streets and drainage systems to the City. The deed was recorded in error by the project’s private engineers without the City’s awareness. SHOWN LEFT TO RIGHT IN THE ACCOMPANYING PHOTO are Mayor Marilyn Hatley, City Manager Mike Mahaney, Patrick Wyatt, Melinda Chappell, Jesse Lind, Lavern Anderson, Josie Bonafant, John Kellom, and Tim Corbett.